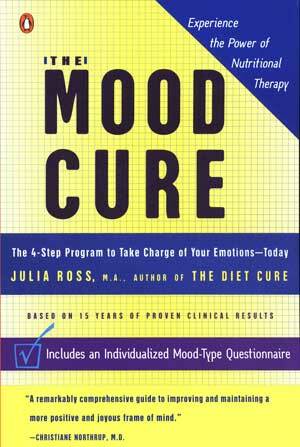 The following protocol was developed at Julia’s The Nutritional Therapy Institute Clinic after the publication of The Mood Cure when we began to see some antidepressant detoxers who needed more help for insomnia and agitation than they could get from the nutritional support program listed on the previous pages. The clinic can supply cortisol test kits and advise virtually on how to interpret and act on test results. Please call the Virtual Clinic at (415) 383-3611 to learn more or email info@cravingcure.com. The primary stress-response hormone produced by your adrenal glands is called cortisol. It is even more potent in some ways than adrenaline, but at normal levels it is not agitating, rather it is strengthening. It’s your wake-up-and-tackle-life’s-challenges hormone. Cortisol levels are supposed to be highest in the morning and lowest between about midnight and 4:00AM. If levels are too high, you’ll feel wired, tense and hyper-vigilant. Our cortisol levels always rise above the normal level to help us cope with severe stress. This can happen, for example, during a divorce or as a reaction to withdrawal from medications, like benzodiazepines or antidepressants, often causing severe agitation and insomnia. Cortisol levels should return to normal after the stress is relieved, but sometimes chronic stress goes on for so long that the adrenals make a permanent adaptation to a new, hyper level of cortisol production. Eventually, our adrenals can become so exhausted by this constant demand for extreme cortisol production that they are no longer able to produce even moderate levels. Their cortisol output can drop too low throughout the day, especially in the late afternoon. This can be experienced as a sudden crash or a gradually increasing fatigue. But, surprisingly often, 1 – 5 AM cortisol surges persist for years, causing chronic insomnia and anxiety. Whether you are in sudden or chronic over-stress. A simple one-day (4-sample) home saliva test will reveal your bedtime and early morning cortisol levels as well as your mid-morning and late afternoon levels. See the Adrenal Tool Kit, for details on testing the levels of this vital indicator. If you wake up between 1:00 a.m. and 5:00a.m., ask for an extra (fifth) test vial. The reference range should be the same or lower than the bedtime range. If cortisol levels are too high at night, instead of very low, as they’re supposed to be, you’ll be kept up too late with a “second wind.” Or your cortisol levels could rise too high early in the morning and wake you up prematurely. Or you could wake up between 2:00 and 4:00AM and not be able to get back to sleep easily. Are you a night owl? Testing may show that your cortisol is above normal levels between 10:00PM and midnight when it should be dropping to allow you to get to sleep. If you are a night owl, a supplement containing a cortisol-regulating nutrient called phosphorylated serine (brand name Seriphos, this is not the more readily available phosphotidyl serine), taken before dinner (approximately four-six hours before bedtime), should get you to sleep. If you wake up between 2:00 and 4:00AM take Seriphos at bedtime (by 10:00PM), 4-6 hours before you would typically wake up in the early morning. If you have trouble getting to sleep and you wake up between 2:00 and 4:00AM, take one capsule before dinner and two by 10:00PM. Seriphos encourages your pituitary gland to stop sending the order to your adrenals for more cortisol production. After a month or so, this normalized message should be permanently re-programmed, and you should not need any more Seriphos. Caution: Do not take Seriphos for more than three months total. Take a break for at least 24 hours after each month’s use (as per bottle directions). A second possible solution: A quicker-acting supplement called hydrolyzed casein or lactium (e.g., De-Stress by Biotics) has calming effects on the brain. It was originally researched in France. Take 75-150 mg. whenever your cortisol is elevated, day or night. It seems to work best if you are also taking Seriphos. Do not take it if you are milk intolerant. Holy Basil can also help. Remedies for daytime mood disturbances caused by elevated cortisol: The same two supplements may be used to lower daytime cortisol levels. Take Seriphos (1-3) hours before your test shows abnormally high cortisol elevation. Or try lactium when your test shows that a cortisol elevation is occurring (you actually feel more agitated then). Retest your middle-of-the-night, early morning, and/or bedtime cortisol again (whichever was abnormally elevated) in three months to see if your levels have dropped to normal.